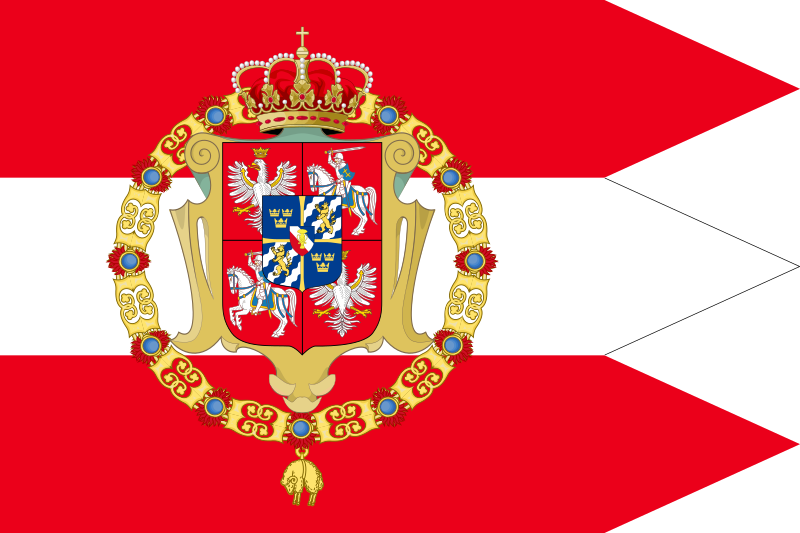 English: Royal banner (not a flag) of the Polish-Lithuanian Commonwealth during the reign of the House of Vasa (1587-1668). Banner with three horizontal stripes of red, white and red. Coat of arms:1-4 Polish eagle (Piastowie's), 2-3 Lithuanian knight (Jagiellonczyk's), 5-8 Swedish three-crowns (Magnus IV's), 6-7 Swedish lion (Magnus I's), inescutcheon: 9 Vasa's garb. 7 décembre 2012 à 07:04 900 × 600 (2,29 Mio) TRAJAN 117 More historical eagle and knight taken from File:Herb Polska (Alex K).svg and File:Herb Lytwa (Alex K).svg. 23 novembre 2012 à 13:53 900 × 600 (1,55 Mio) TRAJAN 117 Last adjustment, hopefully! 26 juin 2011 à 22:06 1 200 × 800 (1,49 Mio) TRAJAN 117 Newer crown, shield, collar etc. Ce document provient de « https://fr.wikipedia.org/wiki/Fichier:Chorągiew_królewska_króla_Zygmunta_III_Wazy.svg ».